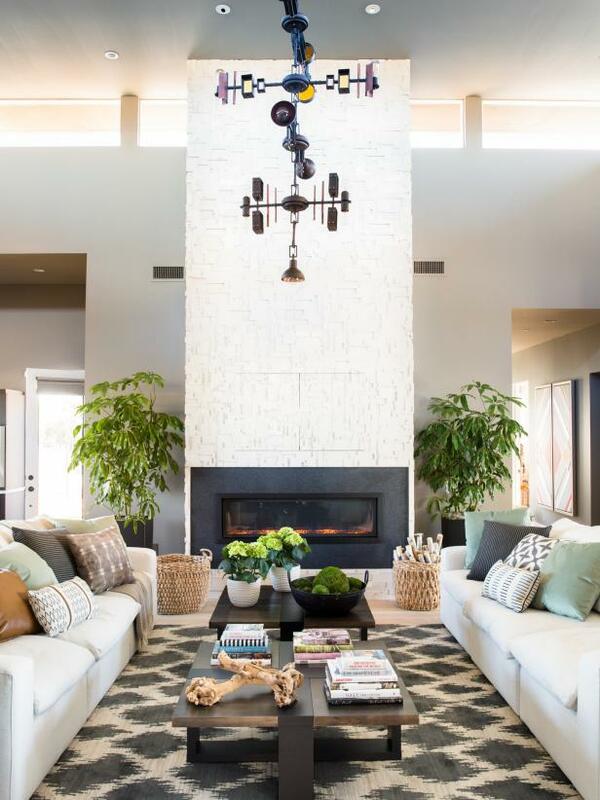 The spacious great room with two inviting sofas, custom designed fireplace and soft, neutral-based textiles offers a comfortable and stylish space for lounging and entertaining. 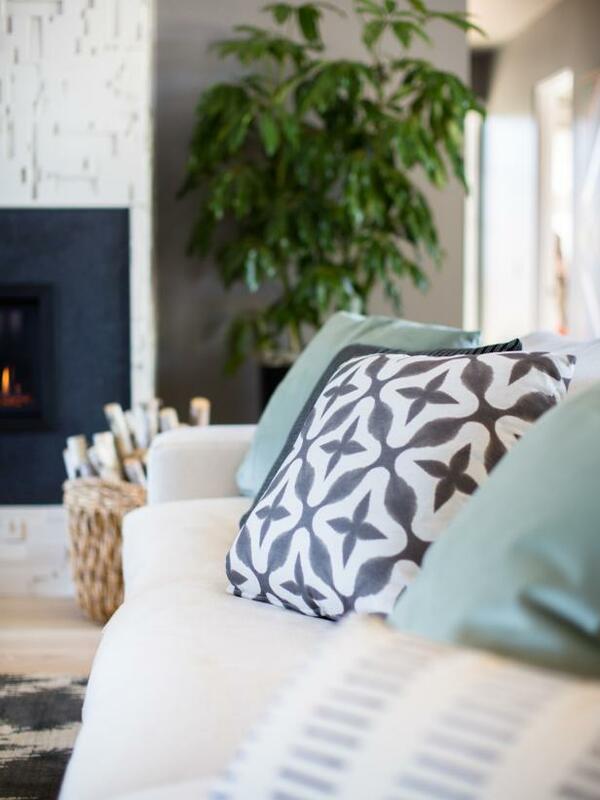 A selection of square accent pillows in neutral colors and patterns sit on the sofas for comfort, with a pair of lumbar pillows for extra back support. 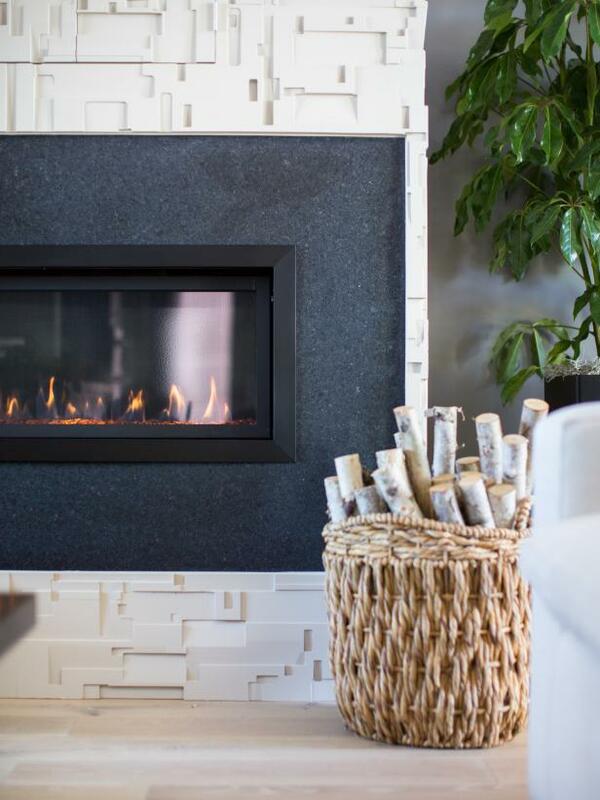 The focal point of the great room is a natural gas fireplace with a safety screen, accent lights and a remote control for temperature adjustment. 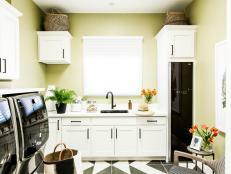 It’s framed in black satin tile with a tall white textured tile surround and features an inset high-definition TV hidden behind pocket doors that make it invisible when not in use. 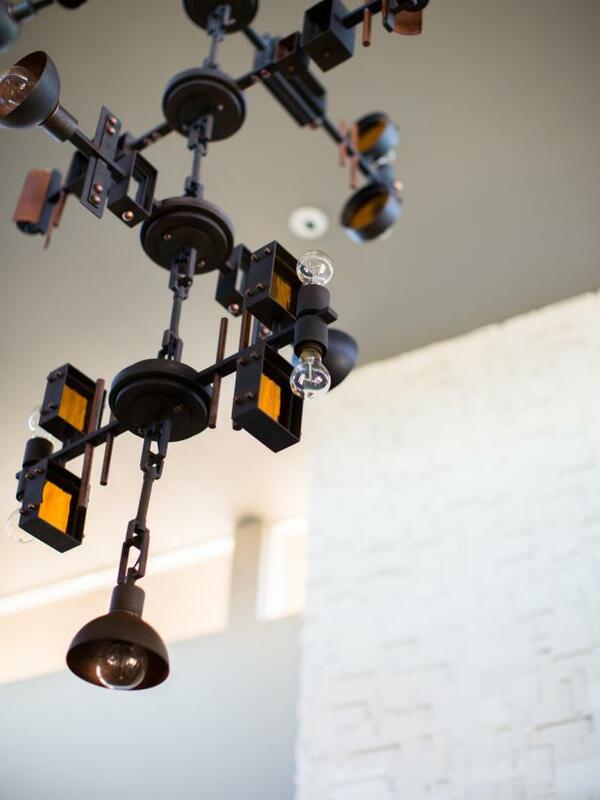 The massive light fixture that hangs from the ceiling in front of the fireplace combines rustic iron, copper, colored glass accents and vintage-style bulbs for a distinctive style statement that provides the perfect amount of light at night. 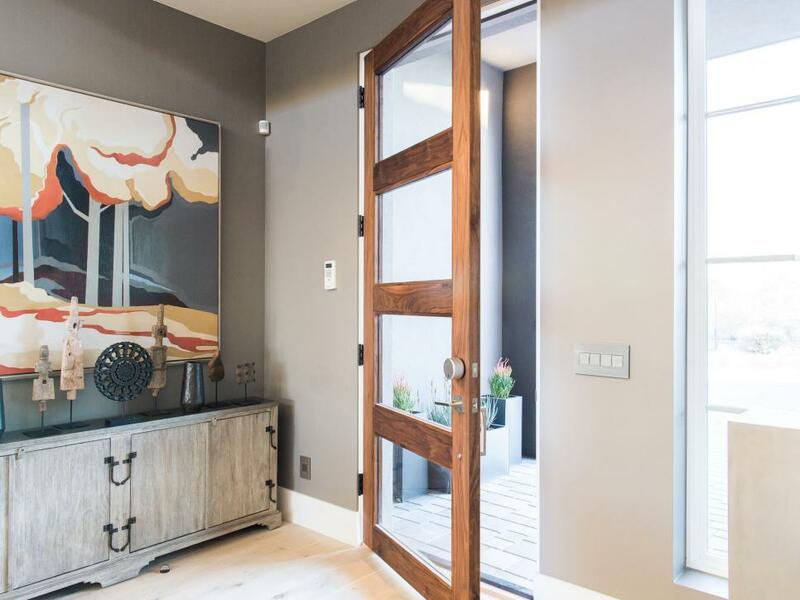 When the pocket doors are open, the 65-inch high-definition TV offers top-of-the-line image quality with a voice-activated remote and a time zone streaming media app built right in, so no additional streaming media player is needed for film, music or TV content. 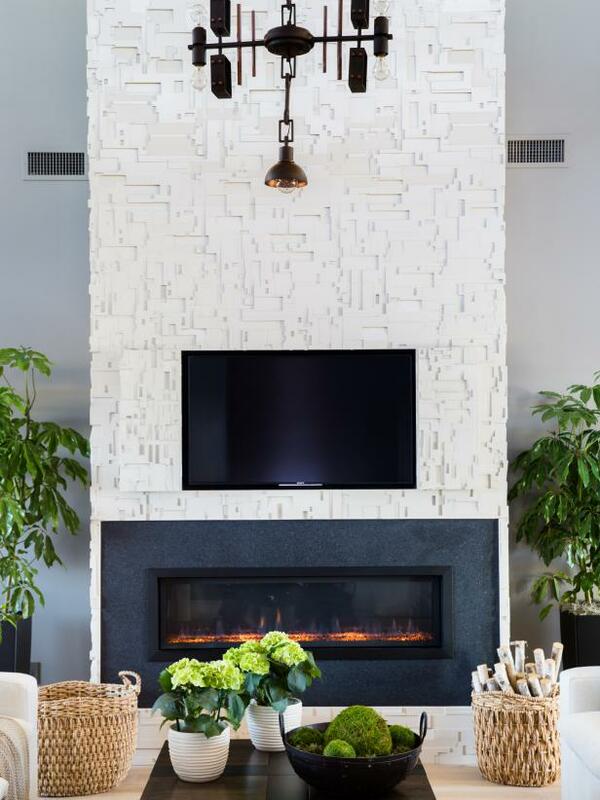 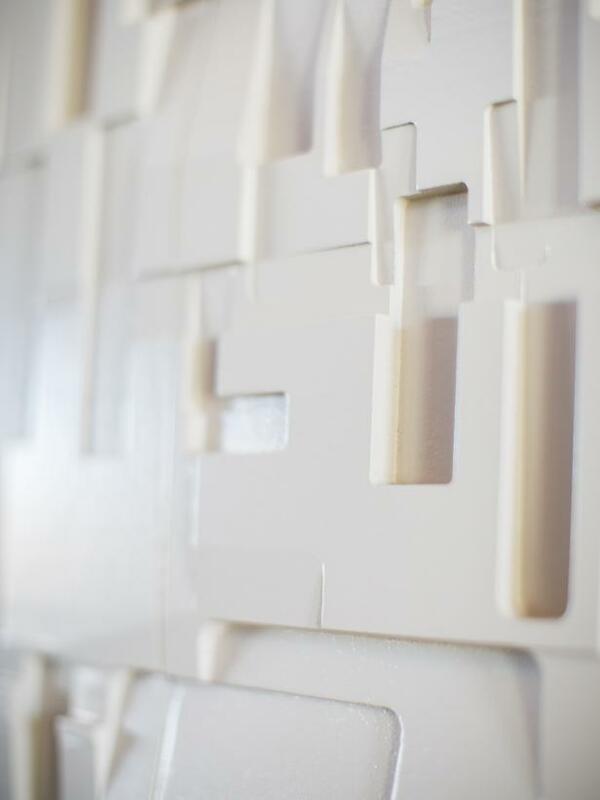 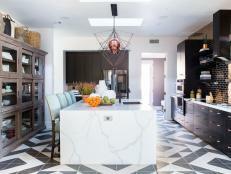 The white textured tiles that create the impressive fireplace surround resemble rock formations seen in the Arizona landscape, but also have the look of a circuit board, which makes it the perfect design feature for HGTV Smart Home 2017. 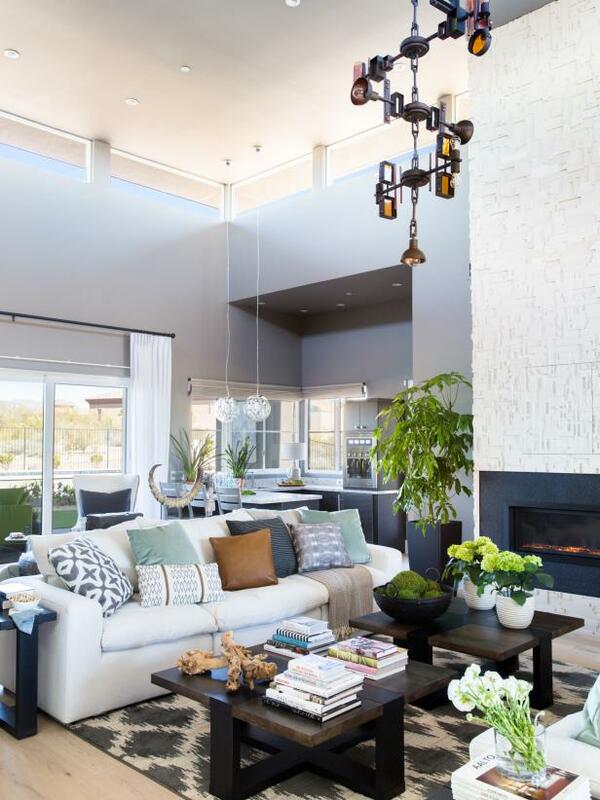 A woven basket placed on each side of the fireplace offers easy-access storage for a variety of great room essentials. 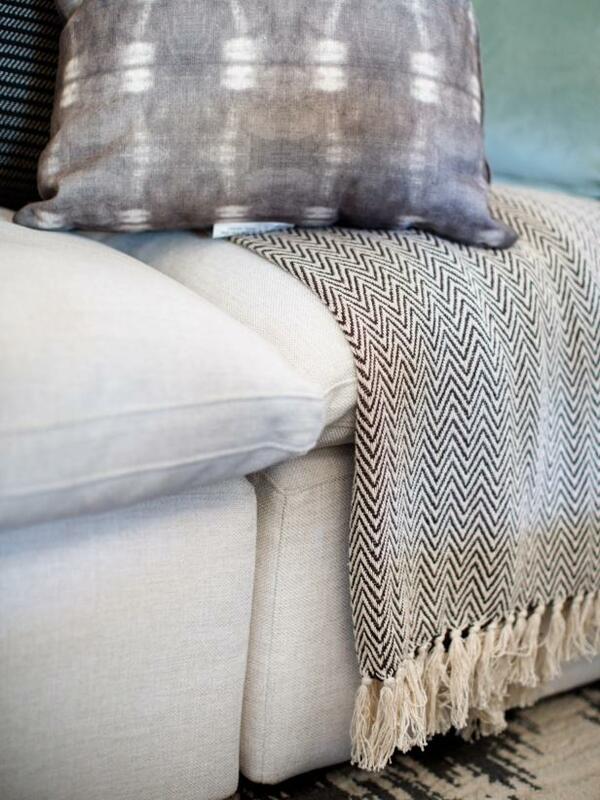 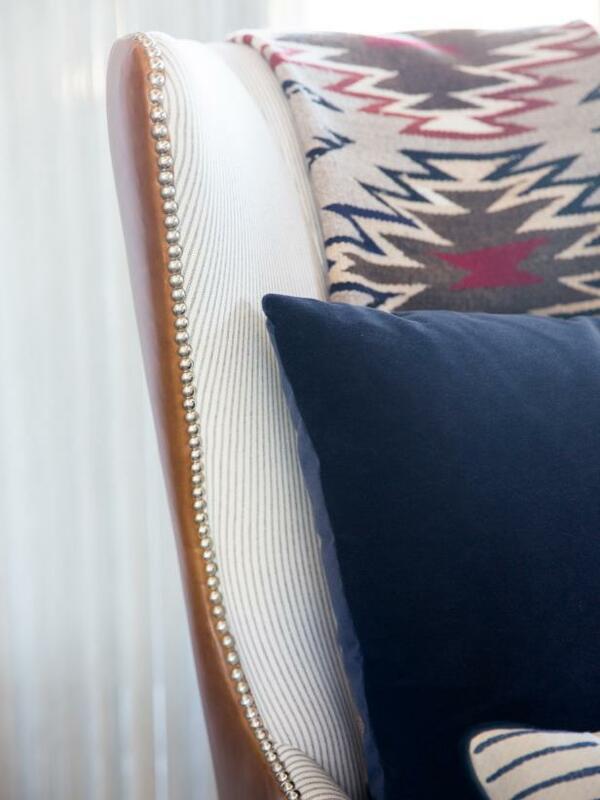 A soft and textural neutral throw with a chevron pattern on one of the sofas adds warmth for chilly nights. 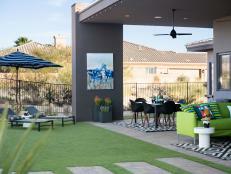 This view from the great room looking towards the home's front entry highlights the central location of this space, that sits steps away from the adjacent kitchen, dining room and covered patio outside. 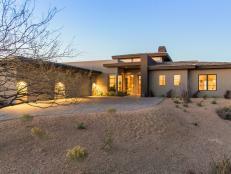 The front door of the home off the covered entry leads into the foyer, which spills right into the expansive great room with alluring views of the backyard. 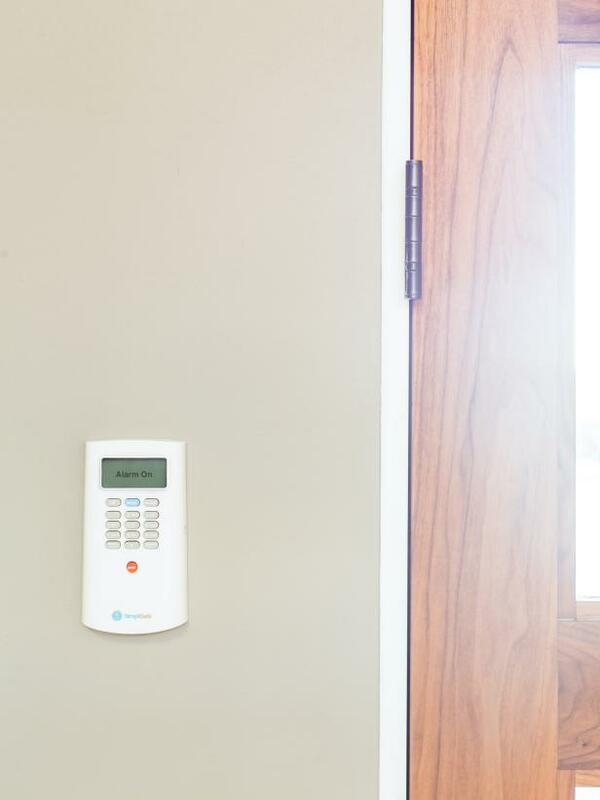 A keypad located right inside the front door in the foyer, part of the home's top-notch wireless security system, features a home mode that deactivates motion detectors but protects windows and doors and an away mode that activates all sensors. 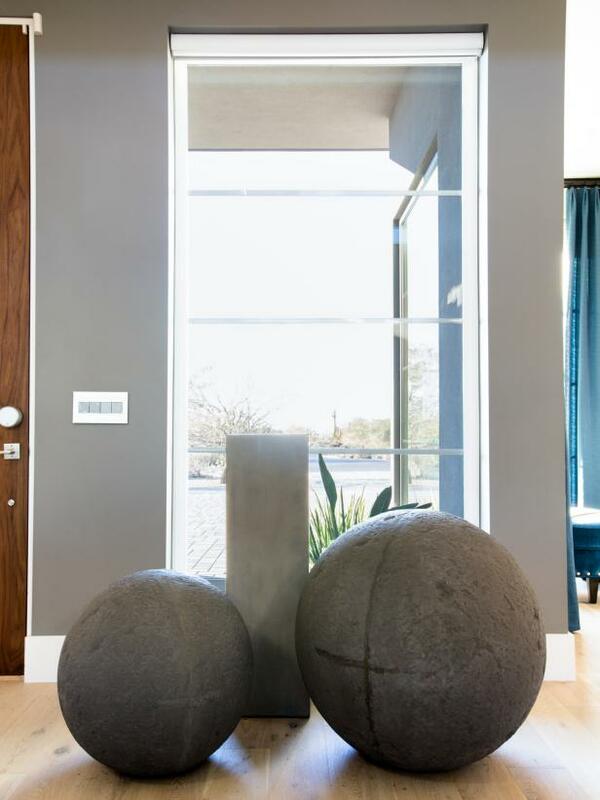 Large sculptural spheres placed by the front entry offer a fun and decorative way to balance the linear lines of the home. 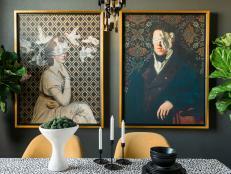 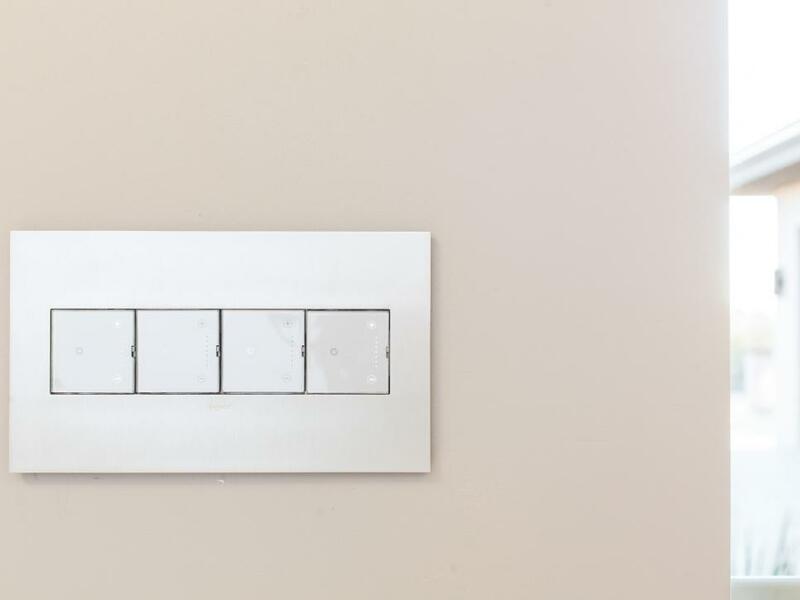 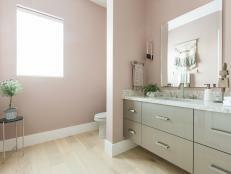 The light switches and outlets that are part of the home's smart lighting system sport a unique square shape and come in a range of designer finishes. 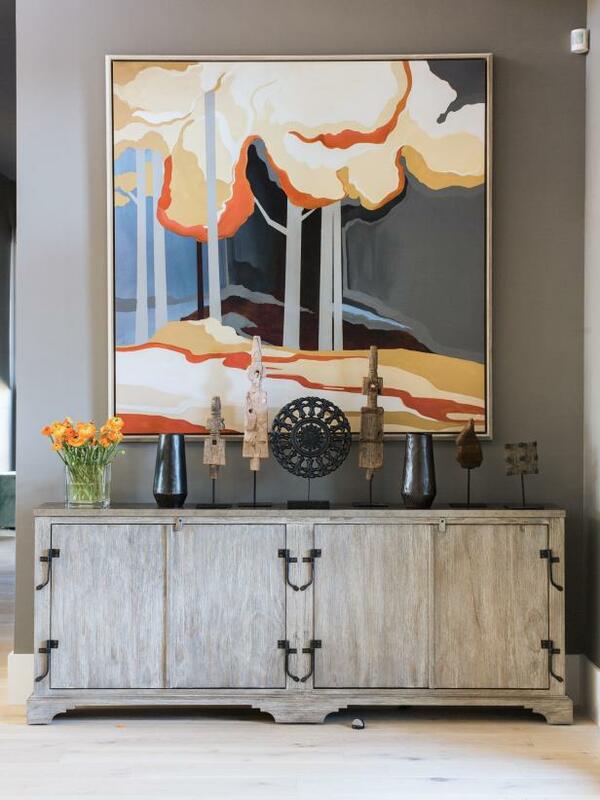 An eye-catching cabinet that features flat doors with forged shutter hinges, a hand-tacked tin top and Driftwood Oak finish offers storage for great room essentials and display space for decorative accessories. 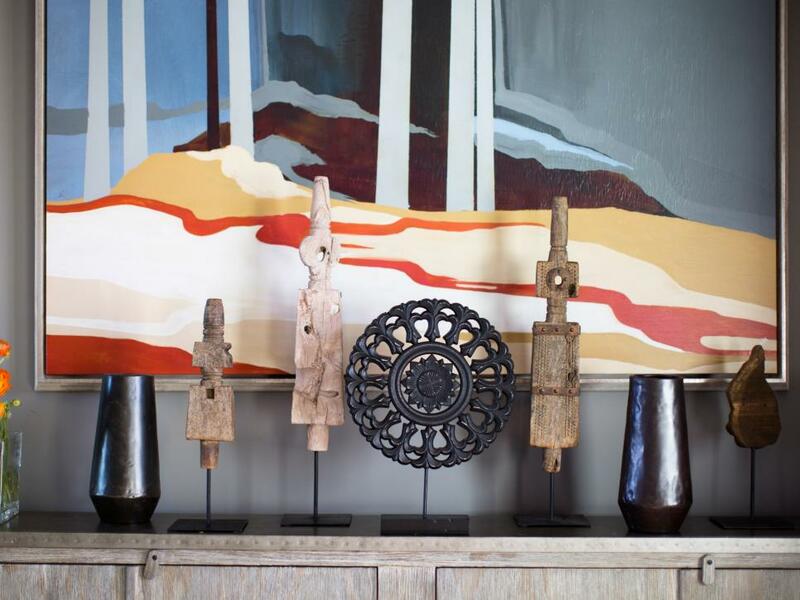 The decorative accessories includes vases for fresh flowers and an assortment of sculptural pieces that celebrates the area's amazing artistry. 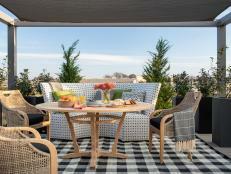 The two rustic chic cocktail tables placed between the great room's casual and comfortable sofas highlight the distinctive grains and natural beauty of the solid wood used to create these pieces, with a two tone finish. 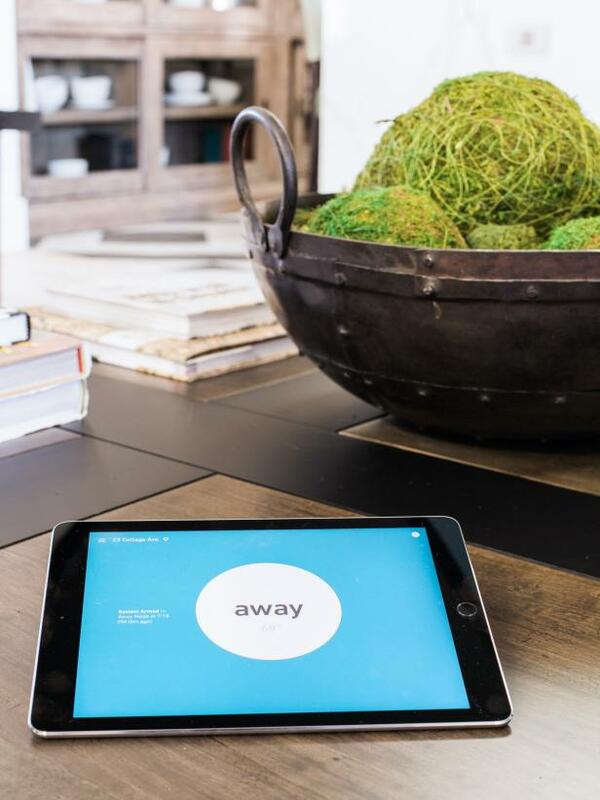 The completely wireless security system with base station, wireless keypad, entry sensor, motion sensor and more makes it easy for the homeowner to monitor the house remotely. 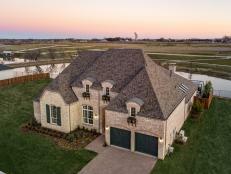 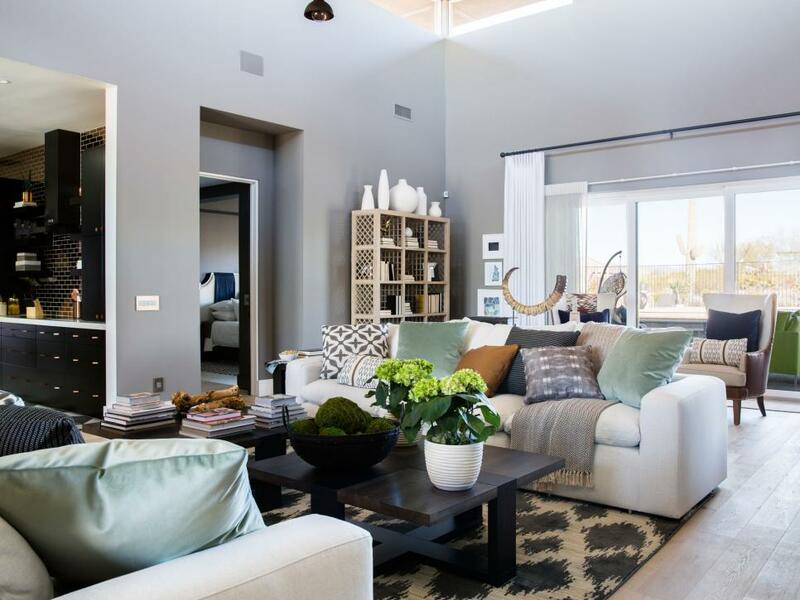 This wide view of the great room shows the close proximity of the kitchen, master bedroom and covered patio outside, for a user-friendly home with great flow. 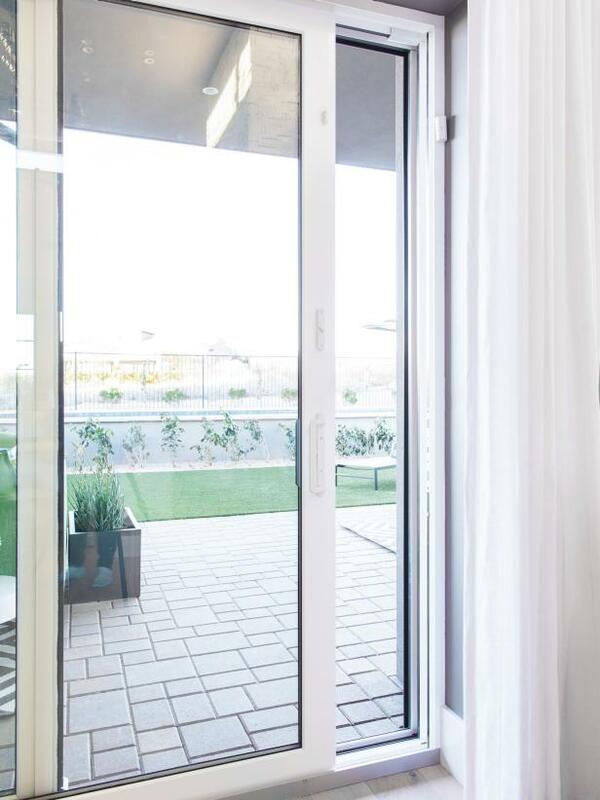 Smooth-sliding vinyl patio doors allow fresh air inside and provide an easy transition from the great room to the well-detailed covered patio in the backyard. 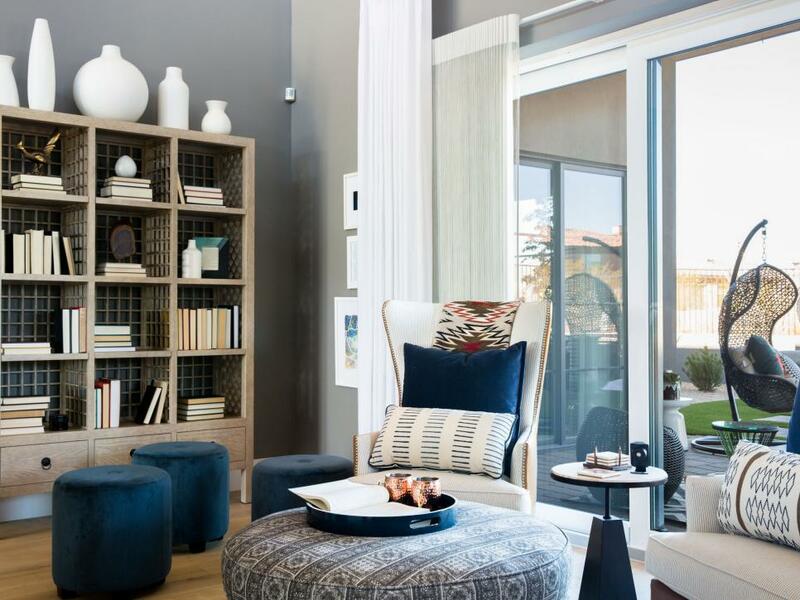 The great room includes a separate and more cozy seating area with curved wingback chairs that offers a spot for reading and relaxing. 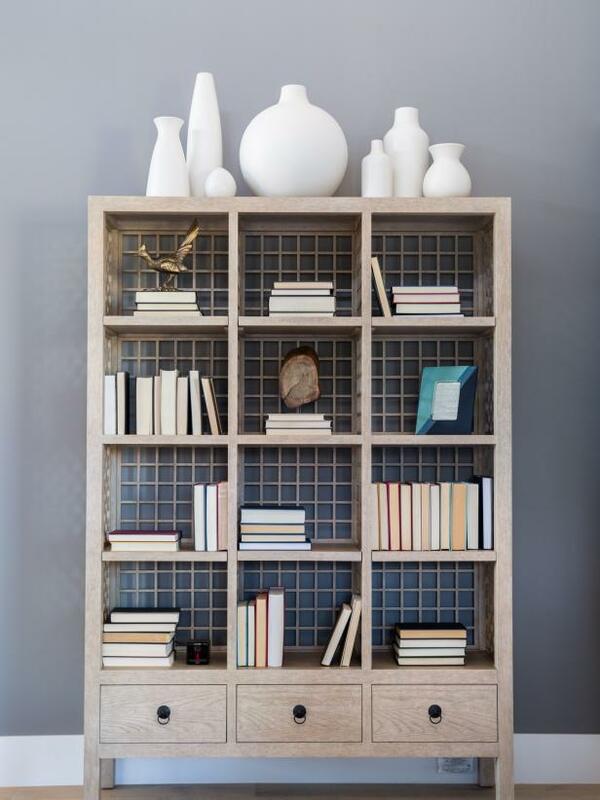 A simple yet elegant bookcase offers display space for books and accessories, with three drawers on the bottom that feature hand hammered iron-ring pull hardware. 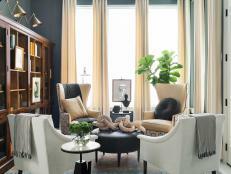 The inviting curved wingback accent chairs include pillows for comfort, and a textural throw with a Southwest pattern. 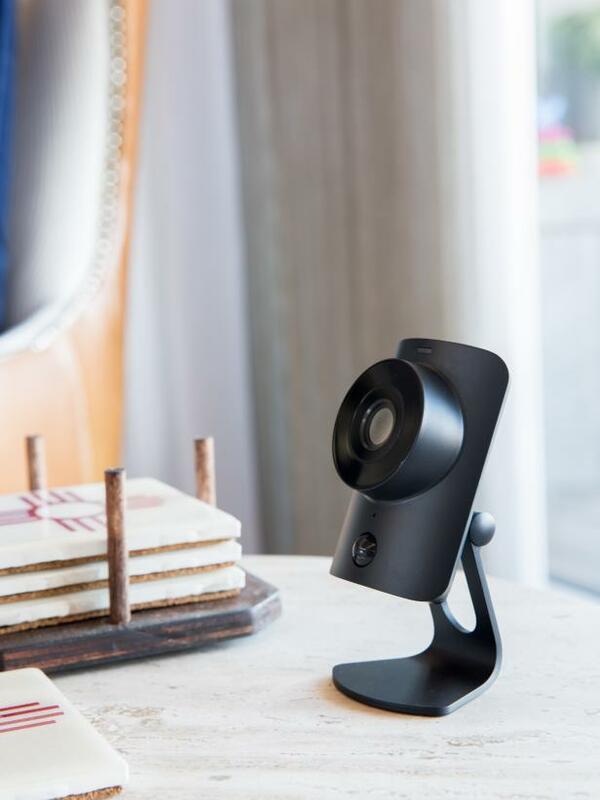 Part of the home's comprehensive wireless security system, an indoor camera placed in the great room streams crystal clear 720p HD video that allows monitoring of the home from an app. 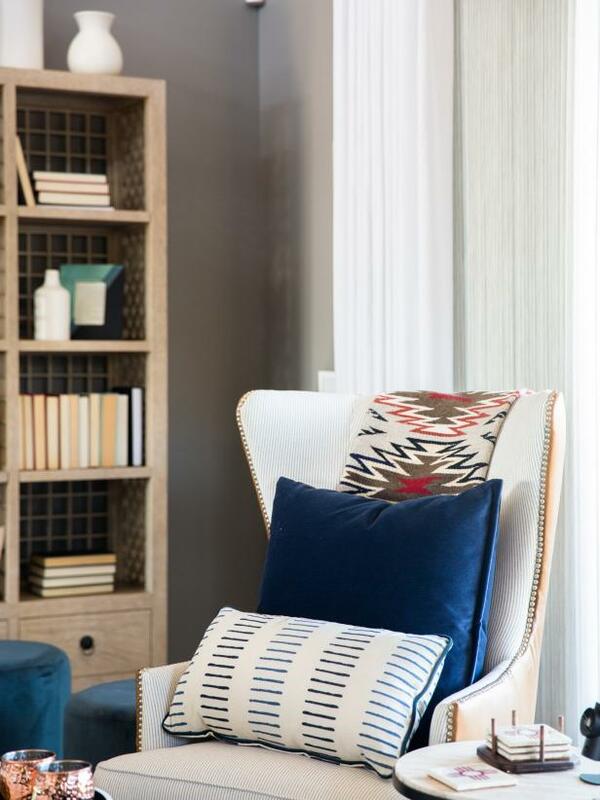 The attractive curved wingback accent chairs feature a nailhead trim detail for a distinctive, finished look. 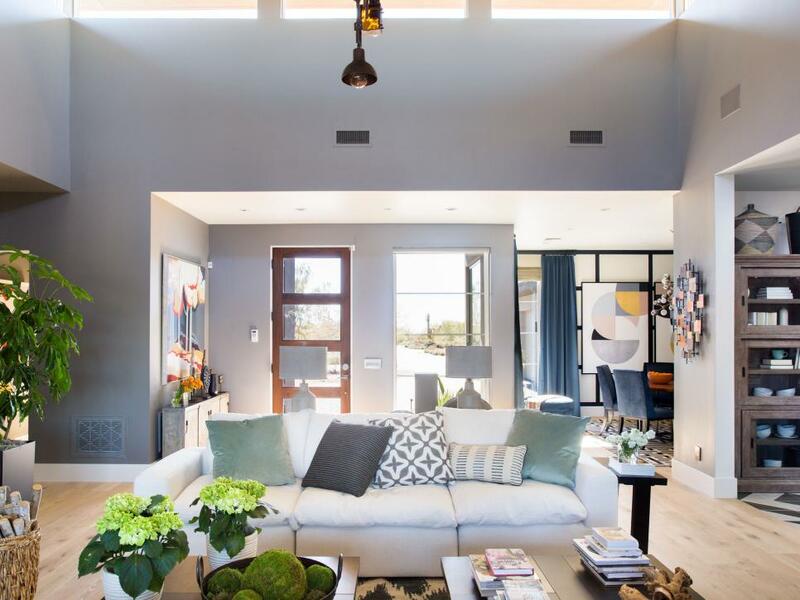 This wide view of the great room from the foyer shows the open and easy layout of this welcoming space, with the backyard beckoning from outside. 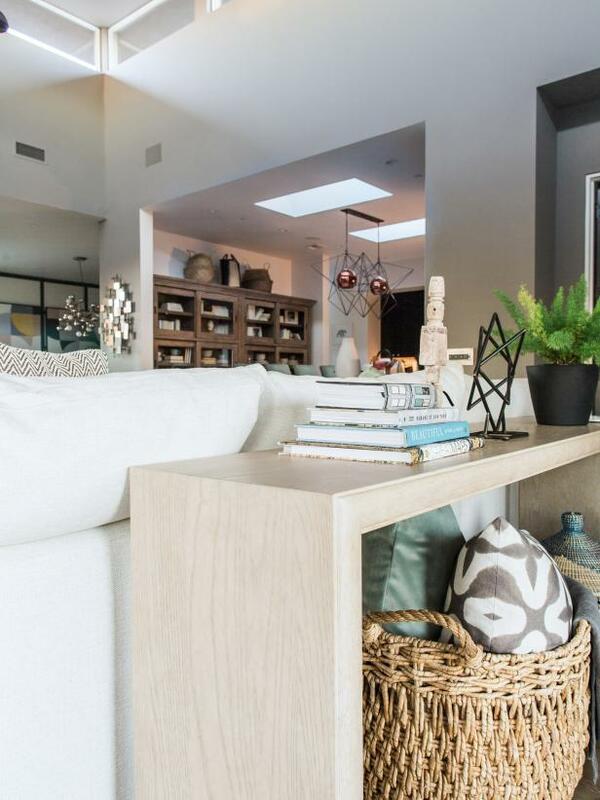 A modern console table was placed behind each sofa for displaying decorative accessories, with open space below for baskets that hold extra throw pillows. 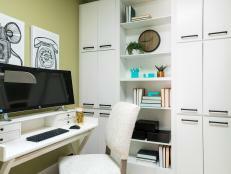 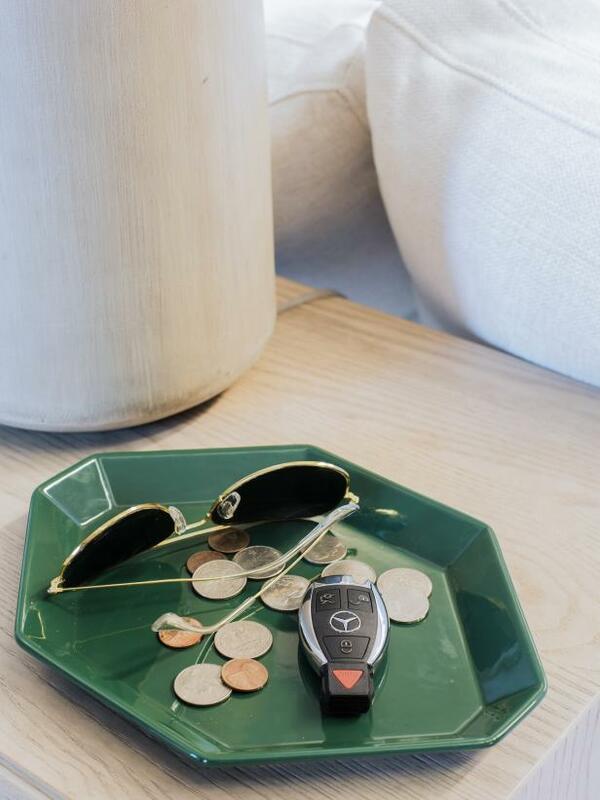 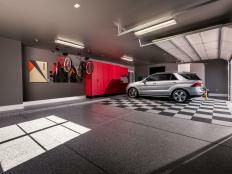 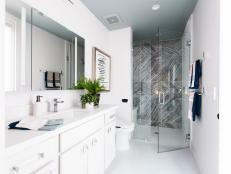 A ceramic tray in the great room provides a home for loose change, sunglasses and the key for a hybrid plug-in SUV that sits in the HGTV Smart Home 2017's garage. 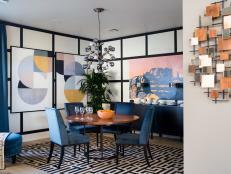 A view into the great room from the adjacent dining room shows the strong connection between spaces, with the home's wet bar seen in the background.